Viktor Jakabfi is one of the group of successful Hungarian composers who dominated the European musical stage in the early 20th century, but who lost his way when he left his native country. Jacobi studied at the Budapest Zeneakadémia, alongside Kálmán and Szirmai, and was still a student when his first work was produced at no less a venue than the Budapest Népszinház (as Jakabfi). A rátartós királykisasszony (the proud princess), described as a mesejáték (fable, fairytale) in 5 scenes, and based on Holger Drachmann’s Der var en Gang (once upon a time) was written by Jenö Heltai, the lyricist of the recently produced János vitéz. It was played a respectable 33 times with Klára Küry in its title-rôle. Still in his early twenties, Jacobi collaborated for the first time with librettist Ferenc Martos on A legvitézebb huszár (the bravest hussar), in which Ákos Ráthonyi appeared with great success at the Magyar Színház, and he also set Heltai’s lyrics for the fairy play A tengerszem tündére (the sea fairy) (‘Ha én rózsa volnék’, ‘Ki vagy te gyönyörüségem’, ‘Be sokat igér s ki tudja mier?’) in which Ráthonyi and Olga Turchanyi featured at the same house. He subsequently gained a considerable success with his score to Martos’s musicalization of Mór Jokai’s poetic fairytale Az istenhegyi székeley leány, produced at the Király Színház under the title Tüskerózsa (prickly rose) with a top-class cast including Sári Fedák, Márton Rátkai, József Németh and Kornél Sziklai. The Király Színház in Budapest, 1900. In 1908 Jacobi supplied the accompanying music for Martos’s ten-scene 100 év mulva (100 years after), and the Király Színház also mounted his Operette Van, de nincs (there is, but there isn’t) in which Vilma Medgyaszay scored a hit with the gavotte ‘Szökellö keskeny ici-pici láb’, as well as another Martos fairytale Operette, Jánoska, again with Fedák featured (‘Tul, tul, tul az óperencian’), which initially ran rather less long than its predecessors, but which was brought back as late as 1925 for a revival at the Király Színház (24 October). In spite of the fact that he had been collaborating with some of the finest writers in the Hungarian theatre, the breakthrough into wider success only came when Jacobi moved purposefully on from the János vitéz-influenced type of mythical/fairytale subject which these early works had used, and into something more attractive to the strivingly up-to-date theatres of the outside world. That success was accomplished with Leányvásár, a piece which took the American west as its setting, the well-used fair-wedding plot, most famously used in Flotow’s Martha, as its basic element. 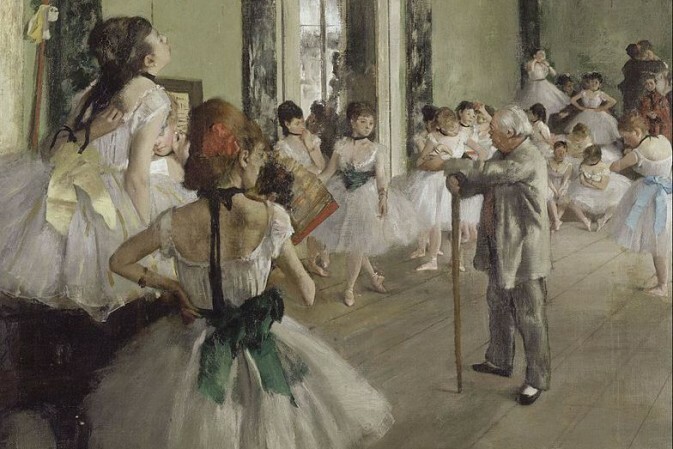 The composer filled his score to the brim with the kind of dancing melodies the English-speaking theatre currently favoured, melodies that were however coloured with an individual and, above all to the foreigner, exotic Hungarian tint. A major hit on its production in Hungary, Leányvásár went on to become a worldwide property, a veritable smash in London, and it remains a solid element of the basic Hungarian repertoire up to the present day. The musical-comedy-styled Leányvásár was followed up by an even bigger success when Martos, Miksa Bródy and Jacobi collaborated on a second outward-looking piece, but this time one which had more of the romantic operetta element mixed with its lively dances and songs and its comic moments. 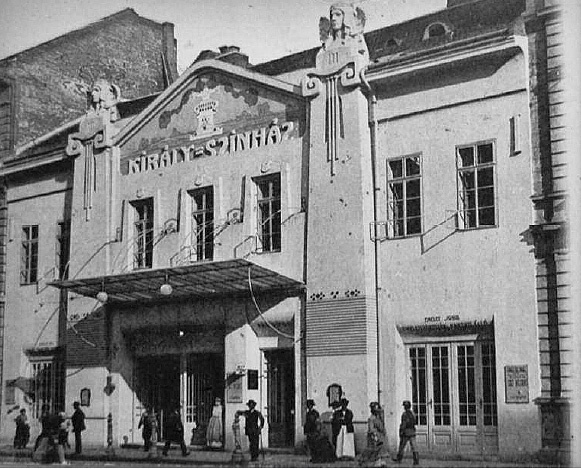 Even in the face of the competition coming from Vienna, in particular, on the eve of the First World War, Szibill proved to be one of the outstanding musical plays of its time, and Jacobi’s newly established international reputation was well and truly confirmed. 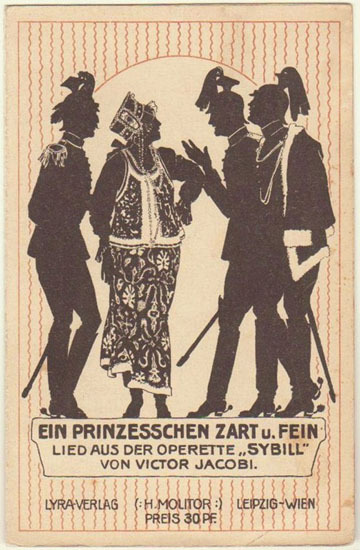 Sheet music cover for Viktor Jacobi’s”Sybill”: “Ein Prinzesschen zart und fein”. The composer was not slow to follow up this success and, in 1914, he was to be found in London, where The Marriage Market (Leányvásár) was still running, and where it was rumoured that he would write the score for George Edwardes’s next piece, when the war broke out. There was no question of Edwardes or anyone else employing any Central European composer whilst Britain was at war with Central Europe, and people like gossip columnist and aspiring composer Jimmy Glover were busy rooting anyone with a remotely Germanic name out of every seaside band in Britain. Jacobi’s British prospects went down the drain along with those of Jean Gilbert who, like him, had recently become a West End favourite. When another rumour was spread to the effect that perhaps he had composed some music for Edwardes already, and that Paul Rubens had accommodatingly put his name to it, Rubens took the rumour-monger to court, and won. Jacobi, in the meantime, moved on to America, where it was still possible for an Hungarian composer with a few hits to his name to find work. 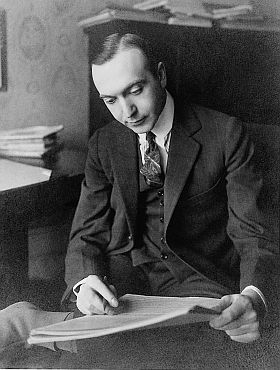 He quickly became naturalized as an American citizen, and his name soon appeared on a Broadway bill, as the composer of Rambler Rose (1917). Broadway’s Szibill star Julia Sanderson featured, but Harry B Smith’s book was a now-you-marry-money-now-you-don’t sort of piece, far from the colourful romance of the Hungarian show, and Rambler Rose lasted only 72 performances on Broadway. 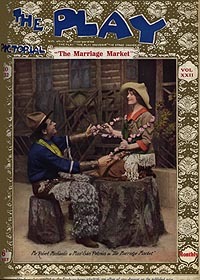 Apple Blossoms, two seasons later, was based on a similarly slight tale of the road to marriage. This time, Jacobi shared the composing credit with Fritz Kreisler, but it was his ‘You Are Free’ and ‘Little Girls, Goodbye’ which proved the pick of the score through the show’s seven months of Broadway run and subsequent life on the road. 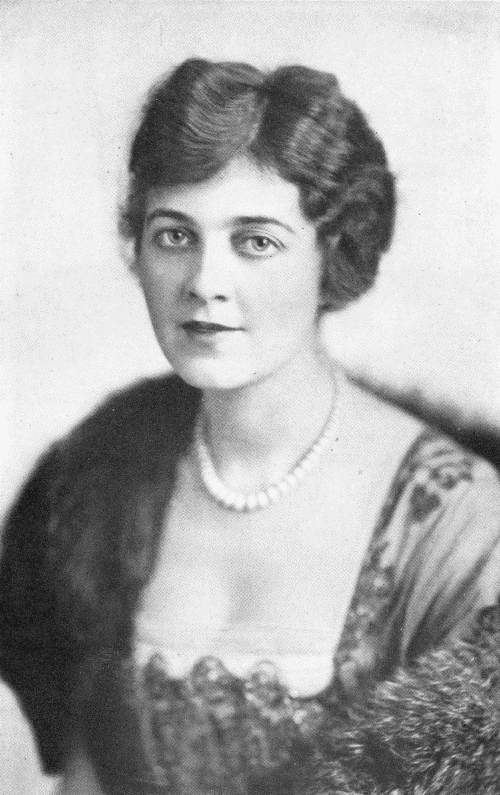 Broadway’s “Sybill” star Julia Sanderson (1887-1975). This taste of almost-success apparently encouraged Jacobi to stick with the marriage-and-money type of libretto (and with routine librettist Le Baron) which seemed so alien to his style of composition, and it proved a mistake. The Half Moon was a quick flop in spite of a cast headed by Joseph Cawthorn, Joseph Santley and Ivy Sawyer, and an attempt by Dillingham to give the composer an opportunity to work in his Hungarian element also failed. 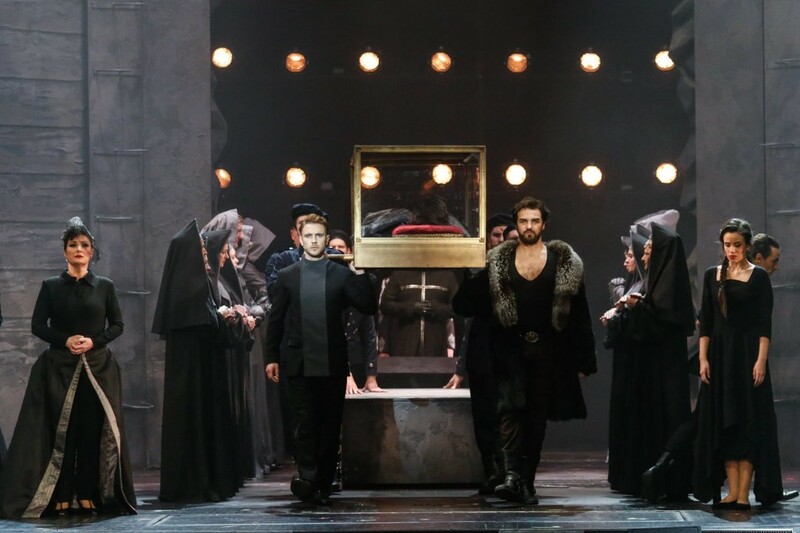 Le Baron’s emasculation of Molnár’s A Farkas as The Love Letter did not inspire the now extremely nerve-racked composer to the heights of a Szibill and the show was again a quick flop (31 performances). Jacobi’s American episode had been an almost unmitigated failure. In the few years since his departure from Budapest he had fallen from a pre-eminent place, on a par with Fall, Lehár, Kálmán and Gilbert, in the European musical theatre, and at the same time he had destroyed his health. He died shortly after the failure of The Love Letter. An operetta called Miami, with Jacobi music arranged by Zsigmond Vincze, and attached to an Hungarian-authored libretto set in Florida, was mounted in Budapest several years after the composer’s death. A top-flight trio of local performers in Sári Petráss, Hanna Honthy and Teri Féjes featured, but the local opinion was that Jacobi’s ‘American’ music was only a shadow of that of his pre-war works. A few weeks later the Theater an der Wien in Vienna mounted a half-dozen performances of a version of Jánoska as a children’s Christmas entertainment, as one of the most promising careers of the 20th-century musical theatre went sadly out on the proverbial whimper.